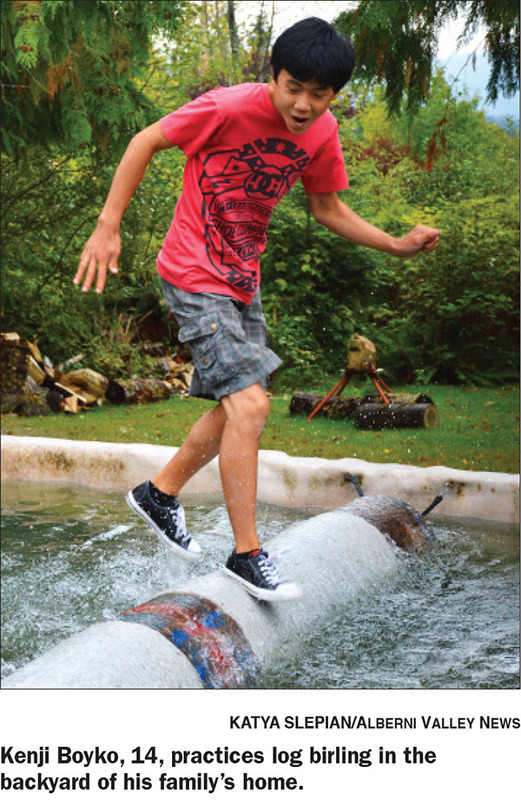 New generation puts the sport into logger sports at the Alberni District Fall Fair. The sound of axes hitting wood and the patter of running feet echo from a large wooden house across the Somass River. While it is fall, it’s not the wintertime that’s being prepared for—it’s the Alberni District Fall Fair.’s annual logger sports competition, which closes out the fair on Sunday. “We have a little pool set up and they’ve got the target there and a log set up for the hand and power sawing,” said Mike Boyko. It’s all set up for Mike’s son Kenji, 14, and their neighbour Nathan Krein, 19. “They’ve been competing for about three years in the men’s novice category for log rolling,” said Mike. For Kenji, it’s the continuation of a multigenerational family tradition. “Passing on down the family line,” said Mike, who’s still log rolling to this day. How did Mike get into it? “My dad. Kenji will be the third generation,” said Mike. 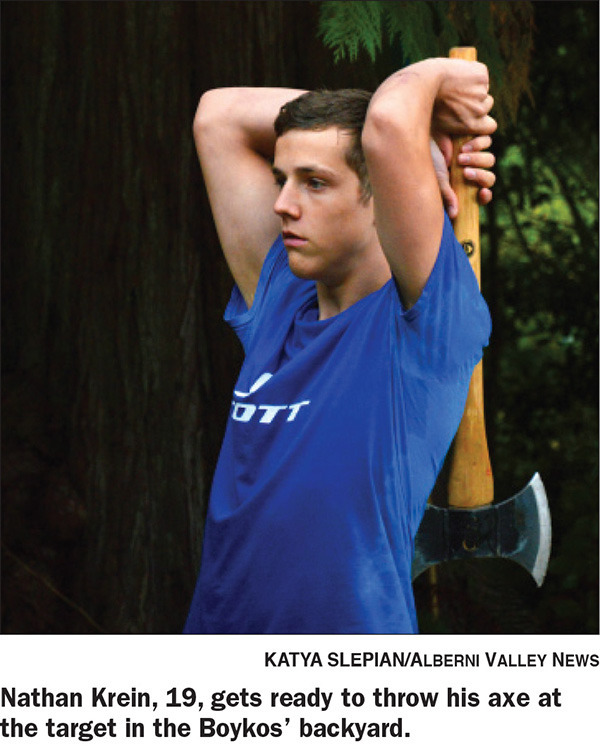 While logger sports started within the logging community, it’s grown outside that. “There’s lots of different people involved, they’re not all traditional loggers,” said Mike. The new diversity is helping continue on the logger sports tradition, Mike said. While the sport used to draw contestants through connections with the logging camps and communities, the slow down in logging in the region has meant that new pools of talent are needed. The only shows left around here are Port Alberni, Ucluelet, Campbell River, Port McNeill and Nanaimo. So there are a few but not like the heyday times,” Mike said. Televised competitions have also changed the look of the sport. “It’s a new generation now and it’s more reality shows,” said Mike. Kenji and Nathan certainly have been, training on a daily basis this summer. “You want to try and do it everyday if you can,” said Mike. “Practice getting on the log, throwing the axes and sawing. Just getting it faster and faster… pretty much keep doing it till you don’t fall off,” said Krein. “It’s very technical,” said Mike. Apart from training long and often, competing against new talent gives the two boys something to aspire to. “They went to [competitions in] Campbell River and Squamish. Squamish has a really big show the August long weekend,” said Mike. The logger sports competition at the Fall Fair will be good for that. Where will Salmon Fest be next year?